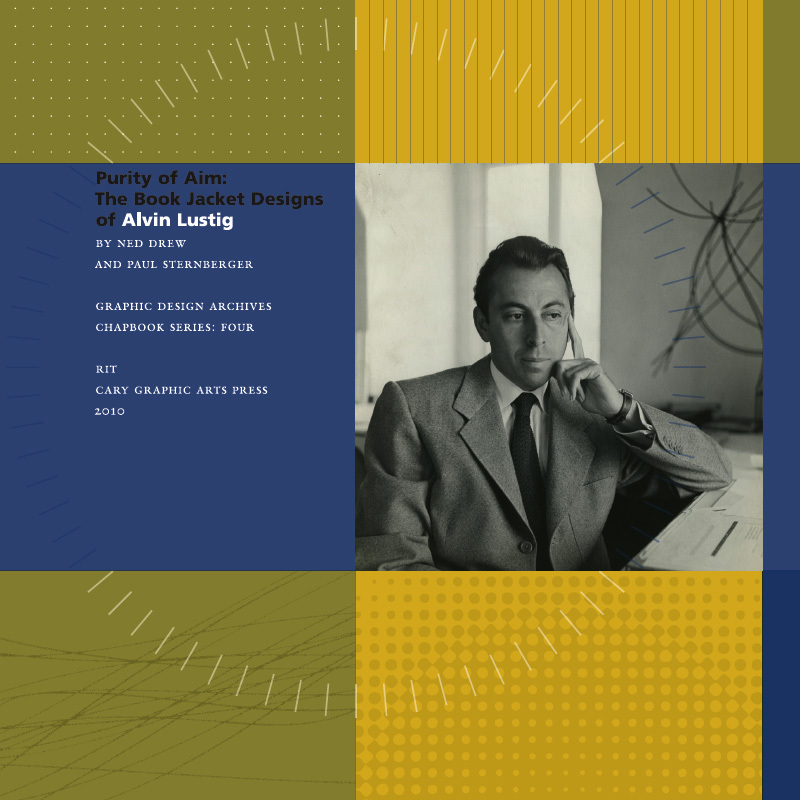 Purity of Aim: The Book Jacket Designs of Alvin Lustig is a colorful and well-researched representation of Lustig’s book cover designs that were created primarily for New Directions Books and Noonday Press, among others. Lustig used the book cover as a vehicle of his bold graphic experimentation that was enhanced by a lifelong collaboration with James Laughlin, founder and publisher of New Directions Books. Ned Drew and Paul Sternberger cite many passages from these letters of correspondence between Lustig and Laughlin which include a range of topics from the early 1940s up to Lustig’s untimely death in 1955. As a modern designer, Lustig’s interests spanned many fields: architectural, industrial and interior design which served as an expression of his deeply held convictions. For him, the designer was not a single-minded specialist, but an integrator of many art forms—and simultaneously, as he saw it, a spokesman for social change. Ned Drew teaches graphic design courses and the history of graphic design at Rutgers University-Newark. He is also the director of The Design Consortium, a student/teacher run design studio that focuses on non-profit, community-based projects. Paul Sternberger (Ph.D.) is an Associate Professor of Art History at Rutgers University-Newark, who specializes in American Art and the History of Photography. He is the author of Between Amateur and Aesthete: The Legitimization of Photography in America, 1880-1900 and co-author with colleague Ned Drew, By It’s Cover: Modern American Book Cover Design. Other publications include various journal articles in American Art, Photographies, and the Journal of the History of Collections.